Brief description: The Yelkouan Shearwater – the project’s main conservation target – is a small to medium-size seabird (it weighs about 330 – 480 g, with a wingspan of 78 – 90 cm), with dark upperparts and bill, and pale upperparts. It is usually seen sitting on the sea or flying just above the water surface. The typical characteristic of tubenoses is the presence of tubular cavities on the upper mandible, which are used to expel salt. This pelagic species spends most of its time at sea, and visits land exclusively to breed. It feeds on small fish, shrimp, and squid, which it hunts at sea by diving to depths of up to 30m; it also feeds on by-catch discarded by trawlers. Its strange vocalizations sound like a crying baby or braying donkey. Yelkouan Shearwaters can live up to 25 years and reach sexual maturity at 2-3 years of age. They nest in colonies on rocky coasts with plenty of cavities, caves, and cracks. Breeding sites are visited and occupied as early as October, with birds generally returning to the site where they hatched. Pair formation takes place until mid-January. They lay a single egg between March and early April, and both sexes take turns incubating over a period of about 50 days. Chicks hatch in May and June, and both parents help feed the nestling, travelling considerable distances to do so (one bird from Montecristo, in the Tuscan Archipelago, followed the coast of Tuscany, Liguria, and France up to the border with Spain). Chicks fledge after about 60 days, in June and July. Colonies remain deserted until the following fall, when the adults return together with a few immatures prospecting future nesting sites. The Yelkouan Shearwater is endemic to the central and eastern Mediterranean; outside of the breeding season the bulk of the population is found in the Black Sea, and to a lesser extent in the Aegean Sea, the Adriatic, and along the coast of north Africa. Its global population is estimated at 15,300–30,500 pairs. Although available information is incomplete, the species seems to be undergoing a significant population loss, of as much as 50% over the last 40 years. The largest known colonies are in Italy, especially on Tavolara, which hosts an estimated 10,000 – 13,500 pairs, between 1/3 and 2/3 of the world population. The species is listed as ‘Vulnerable’ by the IUCN and is included in Annex I of the Birds Directive . It is severely threatened by rats, which predate eggs and chicks; feral dogs and especially feral cats sometimes do the same, and target adults as well. Another threat is accidental capture during fishing operations, especially long-line fishing. Additionally, the presence of strong artificial lights near nesting sites is also a cause of disturbance, especially when the juveniles fledge, and can lower breeding success. 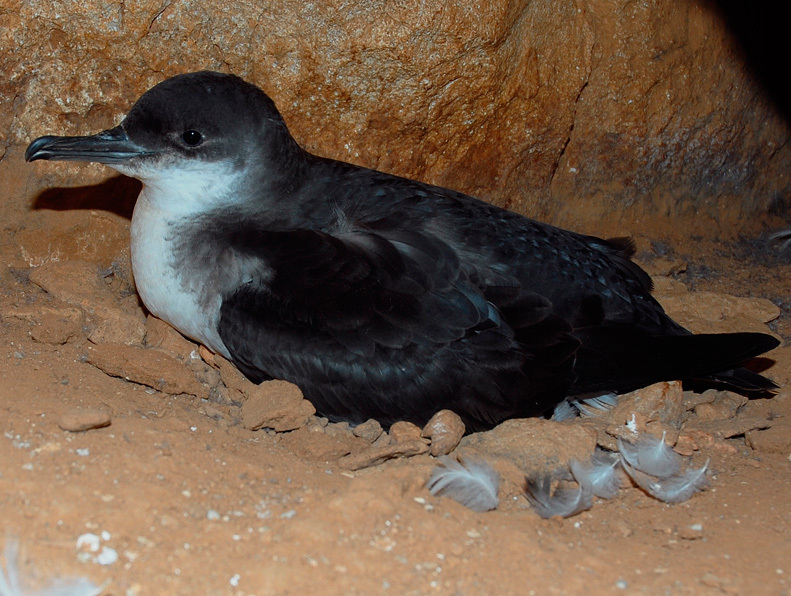 • Baccetti N., Capizzi D., Corbi F., Massa B., Nissardi S., Spano G., Sposimo P., 2009 - Breeding shearwaters on Italian islands: population size, island selection and co-existence with their main alien predator, the Black rat. Riv. ital. Orn., Milano, 78 (2): 83-100. • Bourgeois K., Vidal E., 2008. The endemic Mediterranean yelkouan shearwater Puffinus yelkouan: distribution, threats and a plea for more data. Oryx, 42: 187-194. • Zenatello, M., Spano, G., Zucca, C., Navone, A., Putzu, M., Azara, C., Trainito, E., Ugo, M. & Baccetti, N. 2012. Movements and ‘moving’ population estimates of Yelkouan Shearwater Puffinus yelkouan at Tavolara, Sardinia. (Pp. 39-47). In Yésou, P., Baccetti, N. & Sultana, J. (Eds. ), Ecology and Conservation of Mediterranean Seabirds and other bird species under the Barcelona Convention - Proceedings of the 13th Medmaravis Pan- Mediterranean Symposium. Alghero (Sardinia) 14-17 Oct. 2011. Medmaravis, Alghero.